League of Legends (LoL) is a multiplayer online battle arena, real-time strategy video game developed and published by Riot Games, for Microsoft Windows and Mac OS X. It is a free-to-play game supported by microtransactions and inspired by the mod, Defense of the Ancients for the video game Warcraft III: The Frozen Throne. In League of Legends, players assume the role of an unseen "summoner" that controls a "champion" with unique abilities and battle against a team of other players or computer-controlled champions. The goal is usually to destroy the opposing team's "nexus", a structure which lies at the heart of a base protected by defensive structures. Each League of Legends match is discrete, with all champions starting off fairly weak but increasing in strength by accumulating items and experience over the course of the game. Who is leading the division? Minecraft is a sandbox independent video game originally created by Swedish programmer Markus "Notch" Persson and later developed and published by the Swedish company Mojang. The creative and building aspects of Minecraft enable players to build constructions out of textured cubes in a 3D procedurally generated world. Other activities in the game include exploration, resource gathering, crafting, and combat. Multiple gameplay modes are available, including survival mode where the player must acquire resources to build the world and maintain health, a creative mode where players have unlimited resources to build with and the ability to fly, an adventure mode where players play custom maps created by other players and a spectator mode. The PC version of the game is renowned for its third-party mods, which add various new items, characters and quests to the game. The minecraft division is being led by Hiddenseek (Vevion). You can contact him ingame, on discord, on teamspeak, or stop by his house ;) Your choice! I would like to purchase VIP, how do I do this? World of Warcraft (WoW) is a massively multiplayer online role-playing game (MMORPG) created in 2004 by Blizzard Entertainment. It is the fourth released game set in the fantasy Warcraft universe, which was first introduced by Warcraft: Orcs & Humans in 1994. World of Warcraft takes place within the Warcraft world of Azeroth, approximately four years after the events at the conclusion of Blizzard's previous Warcraft release, Warcraft III: The Frozen Throne. Blizzard Entertainment announced World of Warcraft on September 2, 2001. The game was released on November 23, 2004, on the 10th anniversary of the Warcraft franchise. Ark: Survival Evolved is an action-adventure survival video game developed by Studio Wildcard, Instinct Games, Efecto Studios and Virtual Basement. It is scheduled for release in June 2016 for Linux, Microsoft Windows, OS X, PlayStation 4 and Xbox One. The game's early access began for Windows on June 2, 2015, for OS X and Linux on July 1, 2015, and is scheduled to begin for Xbox One in early 2016. In the game, players must survive in a world filled with roaming dinosaurs, natural hazards, and potentially hostile human players. The game is played from either a third-person or first-person view and its world is navigated on foot or by riding a dinosaur. Players use firearms and improvised weapons to defend against hostile humans and creatures, with the ability to build bases as defense. Players can also customize weapons using items scavenged from the environment. The game has both single-player and multiplayer options, with the latter allowing players to engage in simultaneous gameplay. Development began in October 2014. The development team conducted research into the physical appearance of the dinosaurs, but took creative license for gameplay purposes. Ndarkwind, steam, skype, ts3, facebook, creditcard information, Social security number, Birth Certificate etc. Welcome to Uncut Gaming ARK Server. The approach of the server is to provide a challenging and fun environment at all times. We hope to build a strong community of friendly, dangerous and fair players. No Artifact Cave blocking - You can build near but please allow a safe distance from base defenses for fliers and ground access via natural terrain. No Griefing - Don't kill new spawns. Passive Dinos are no threat to your raid. No Obelisk blocking - We encourage tribes to tackle Spawning Broodmother. No Excess Raid Destruction - Destroy whats needed to enter, don't level a base. Don't destroy open storage but feel free to destroy Smithy/Fabricator and Generator if you wish. No Resource Node Blocking - Tribes seen doing so will get 1 warning before Admin intervention. Also similar to Artifacts, If you build near make sure base Defenses allow free harvesting. Other Caves are Open - Just remember you will take 3times the damage if you do so choose to build. We wanted to keep it low enough that you feel progress but at the same time we don't want to drag the early/mid levels out. Gaining access to late game items doesn't seem rewarding as soon as you step on the beach and don't even have a thatch hut. Do you gain access to all Engrams? No you don't. We want you making choices in everything you do. BUT you do gain access to more Engram points than Official servers do. Every Increment of 5 levels you achieve you receive the official amount plus that level number in Bonus. There is nothing worse than picking up one stone at a time since everything requires it. We could have modified just stone but felt a flat increase across the board be better. We felt 4 times would keep things slow enough so that build progressed in steps but at the same time fast enough for you to gain shelter from the wild. The server setting for Taming is x20 but since we have opted to have Dino food drain at x0.5 that cuts the Taming time in Half. We don't want people to feel they have to log on just to feed their idle tames. While a multiplier of 10 seems quite high it still allows for the use of Kibble. Tames become 10-15min which seems really fast but without Kibble you still have 30min -1hr+ Tames. It's also worth noting Tamed Dino can and will be lost to the wild. Will there be any Wipes? Original idea was for having Bimonthly wipes to stop tribes from becoming too dominant and allowing new players on the server a fighting chance. After some discussions we have decided we will only wipe if necessary. If we feel it necessary it will be discussed in the Steam group and/or Forums. Counter-Strike: Global Offensive (CS:GO) is an online first-person shooter developed by Hidden Path Entertainment and Valve Corporation. It was released on August 21, 2012, and made available for Microsoft Windows and OS X on Steam and Xbox 360. The Linux version was released in September 2014. Like the previous games in the series, Global Offensive is an objective-based multiplayer first-person shooter. Each player joins either the Terrorist or Counter-Terrorist team and attempts to complete objectives or eliminate the enemy team. The game operates in short rounds that end when all players on one side are dead or a team's objective is completed. For most game modes, once a player dies, they must wait until the round ends to respawn. Players purchase weapons and equipment at the beginning of every round with money awarded based on their performance. Completing objectives or killing enemies earns the player money while negative actions, like killing a teammate or hostage, takes money away from the player. In addition, when a round ends all players receive some amount of money, with players on the winning team receiving substantially more. I would say the best place to look for people willing to join is teamspeak. A spin-off from the Age of Empires series, Age of Mythology takes inspiration from the myths and legends of the Greeks, Egyptians, and Norse, rather than from actual history. However, many gameplay elements are similar to the Age of Empires series. Its campaign follows an Atlantean admiral, Arkantos, who is forced to travel through the lands of the game's three cultures, hunting for a cyclops who is in league with Poseidon against Atlantis. Age of Mythology was commercially successful, going platinum four months after its release after selling over one million units. It also achieved critical acclaim, scoring 89% on both GameRankings and Metacritic. In 2003 it was followed by an expansion pack, Age of Mythology: The Titans. 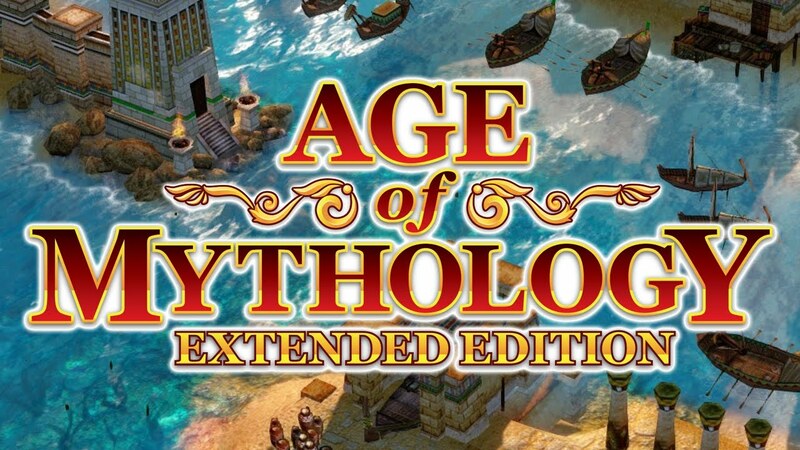 On May 8, 2014, Age of Mythology: Extended Edition was released for Windows via Steam.